The abrasives industry is a vast and unsung hero in manufacturing providing the critical enabling technology for many businesses regarding abrasive epoxy system. Companies in the abrasives industry provide not only the industrial epoxy system but the technology that allows others shape, finish and clean countless parts for manufacturing. From the massive machine tool that grind rolls for the steel industry to the hand-held tools used by dentists, abrasive epoxy system are used in thousands of ways. Abrasive products can be found in the finishing industry supporting cleaning and deburring operations as well as preparation for plating and painting applications. 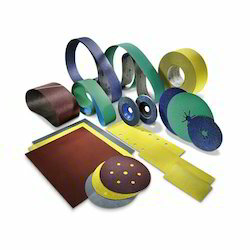 Our Abrasive Epoxy System are used for various applications in abrasive industry such as in coated and bonded abrasive. We have also have suitable flap and flange abrasive epoxy systems in addition to general purpose two-pack adhesive system for abrasive applications.These are manufactured using high grade material and latest technology to meet various preferences of clients. Available in different shapes, sizes and specifications, these base plates cater to the needs and demands of our valued customers.